I left the trail at Buck Lake, which was a day early for this section. I finally decided that the foot pain was too much and I had to pack it in. It never gets better, but is getting progressively worse. My daily mileage is suffering and at some point, I won’t be able to carry enough food to do a section. I achieved a great deal of my health and fitness goals by losing a total of 55 lbs since I quit my job and I think my body is much more fit and healthy. 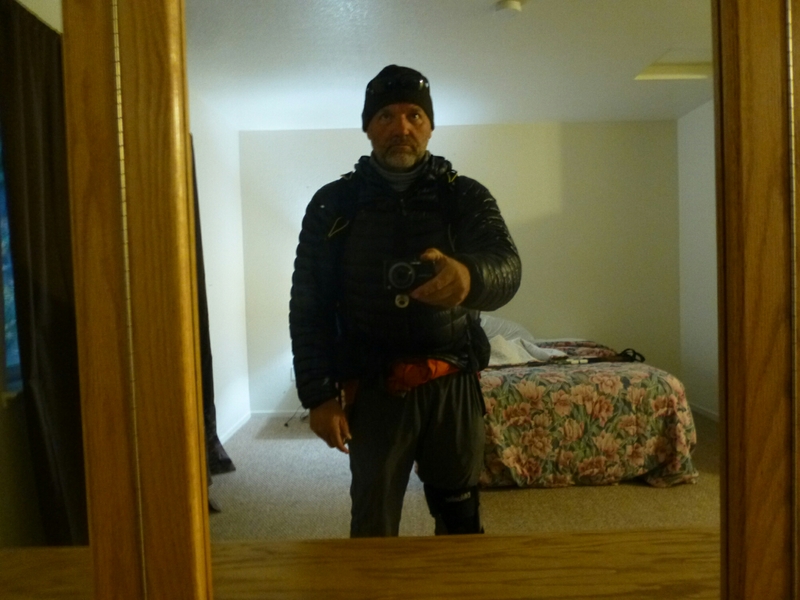 This will be my last PCT trail blog but I will continue blogging on other topics, so stay tuned if you are interested. My trip home from Buck Lake was long, expensive and complicated. I had to walk about 5 hours on the road (ouch!) at which point I caught a ride from two very nice ladies in their 70’s. They took me into Quincy, where I stayed the night in a hotel. The next morning I was to catch the only bus out of town to Chester, but I missed it by 1 minute. I was running down the road behind it but it didn’t stop. I spent another night in the hotel and caught the bus in the next morning (Nov 9). There is a bus out of Chester that goes to Sacramento, but I missed it the day I arrived so I spent the night in a hotel in Chester. The next morning (Nov 10), I caught the bus to Sacramento, but my flight out was the next day, so I spent the night in a hotel. The next morning (Nov 11), I caught a ride to the airport and flew to San Diego where my friend picked me up. I discovered that my phone had fallen out of my pocket in the airplane seat and now lost. I reported it, but there is not much hope of getting it back. The biggest issue is I had all my remaining trail notes on the phone. I spent the night at my friend’s house and then the next day (Nov 12), I picked up my car from storage in Corona. I headed out to New Mexico to pick up my motorhome from storage there, but I soon discovered that I left all my stuff (backpack, electronics, etc) in my friends car and I had no phone to call him. I decided to go ahead and drive as far as I could get. I had no phone and I was traveling through lots of desert with long stretches between services. This made me quite uneasy, but I continued on. When I was 8 miles west of Needles, CA, my car lights started going off, then on, then off, etc. I flipped the light switch, and they stayed on, but the radio stopped working. With a few drops of sweat on my brow, I made it to Needles, but took the exit. When I hit the stop sign at the end of the exit, the engine died and would not start. Turns out, I have a bad battery. I knew this, but figured it would charge up while driving. Nope. I pushed the car to the side of the road and walked to a gas station nearby. They said they could not do anything until morning, so I checked into a hotel behind the gas station. I had no clothes, medications, toothbrush, nothing but what I was wearing. I didn’t even have a jacket. If I would have stalled 8 miles out of town, it would have been a long, cold walk. I found a store where I could get some food and I bought another tee-shirt to keep warm. The next morning (Nov 13), the gas station checked my alternator and found it was OK, so I just replaced the battery. It was fine after that, so I drove on to Albuquerque to pick up my motorhome. As soon as I got to the motorhome, I hooked up my car to the back and headed back to Corona. I made it to Kingman AZ and spent the night in the motorhome in a truck stop. It was a little annoying as the large diesel rigs don’t shut off their engines while parking. The next morning (Nov 14), I made it to Corona and signed up for a month at a local RV park where I can try to get my life back in order. It’s now Nov 20 and I still feel unprepared to start my normal life again. As far as my foot situation, I went to my doctor and she took blood to see if I have diabetes. She also gave me some medication to reduce nerve pain. So far it seems to work a little sometimes. I also saw a podiatrist who diagnosed that I have swelling on my inner ankles which is pinching a nerve that goes to the front of the foot, causing numbing and lighting pain. I was fitted for orthotics, which I won’t see for 2-3 weeks. The orthotics also correct for my left leg being shorter my a couple mm than my right. She believes this will fix all my foot issues. If it does, boy do I wish I would have done this before the hike. It may have been a whole different, and better experience. I’ve completed a couple of 30 mile rides on my road bike and had excruciating pain in my feet and knees. I can’t even stand up to peddle due to the knee pain. I don’t know if I can keep riding if this doesn’t get better. I have no other way to get aerobic exercise to keep my weight down. I can’t run due to my knees. Maybe I can try rollerblading. Selfie from the sterile, scantily furnished hotel in Buck Lake. Still, it costs $100/night and the cheapest in town. The bar associated with the hotel was quite nice and served a good hamburger. I’ll have to visit this town again with my motorhome someday.